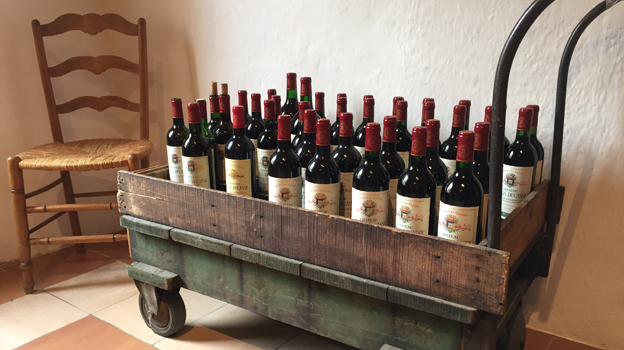 This comprehensive retrospective at Larcis Ducasse spanned a remarkable eight decades and included wines all the way back to 1945 that trace the evolution of the estate during the three distinct eras that bridge those years. In the past, Larcis Ducasse had a checkered track record. This vertical certainly is proof of that. Some of the older wines in this tasting, notably the wines of the 1940s, 1950s and 1960s are terrific, especially considering the eras during which they were made. But other wines, especially those from the late 1980s and early 1990s, are lackluster. As we will see, quality picks up in a meaningful way throughout the 2000s and well into the 2010s. One of the things I admire most about Larcis is its very reasonable price upon release. 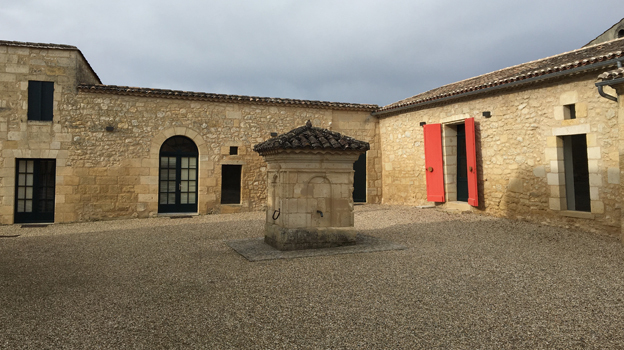 While Bordeaux is often criticized, sometimes justly, for excessively high prices, the reality is that there are dozens of châteaux that make delicious, ageworthy, pedigreed wines that the average consumer can still afford. In fact, some of my favorite vintages in this vertical are not necessarily the most celebrated years like 2005, 2009 and 2010. To be sure, those are gorgeous wines, but they also carry the high, at times inflated, prices of collectible vintages. As a consumer looking for wines to drink, I am frankly more tempted by the 2004, 2008 and 2012, all of which are absolutely delicious right now and offer terrific relative value. Larcis Ducasse has been a family owned property for several centuries. Historical records show the wines were prized at least as far back as the 1800s. The estate’s modern-day history dates to 1941 when Hélène Gratiot Alphandéry inherited the estate. Following the end of World War II, Gratiot Alphandéry moved to Larcis Ducasse and managed the property for several decades. Her son, Jacques-Olivier Gratiot, took over in 1990 and continues to oversee the property with his sister, Jeanne Attmane, and their families. In 2002, the Gratiots appointed Nicolas Thienpont Estate Manager. Larcis Ducasse occupies a splendid position in Saint-Émilion’s on the Côte de Pavie, a striking south-facing hillside. La Gaffelière and Canon-La Gaffelière are just southwest, while Pavie-Decesse, Pavie-Macquin and Troplong Mondot all lie to the north. The eleven hectares of vineyards run from the famed Saint-Émilion plateau, through the heart of the slope and down into the foothills. Atop the plateau the terrain is composed of hard, asteriated limestone. Moving downslope, the soils become a combination of limestone deposits and the clay-limestone mixture known as molasse du Fronsadais, while the bottom slopes are marked by a series of deposits created over time by gravity and the influence of the Dordogne River. 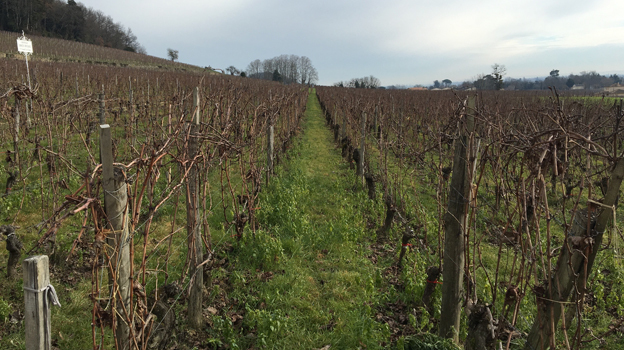 The intertwining of these various soils types and exposures is without question one of the elements that makes Larcis Ducasse such a pedigreed and complex wine. The varietal mix is approximately 80% Merlot and 20% Cabernet Franc. Estate Director Pharaon Roche made the wines from the 1940s through 1978. Clearly, the early wines in this tasting reflect the means and techniques that were available to prior generations. Even so, it is quite evident that the best older vintages in this vertical, specifically those made between 1945 and 1971, were handled with great care, as they have aged exquisitely and remain interesting wines to this day. Philippe Dubois took over from Roche in 1978 and made the wines through 2001. For whatever reason or reasons, the wines of this era are not especially brilliant, nor have they aged particularly well. But ebbs and flows are part of the natural evolution at just about any estate. The dull performance of Larcis during the 1980s and 1990s is part of what makes the last chapter in this story so fascinating. Nicolas Thienpont joined Larcis Ducasse in 2002. Thienpont’s team headed by winemaker David Suire and consultants Stéphane Derenoncourt and Julien Lavenu has elevated quality in a meaningful way, while uncovering the true potential and personality of this site. Today, the harvest at Larcis spans approximately three weeks from the last ten days of September to the first ten days of October. The fruit is destemmed and sorted before being moved gently into concrete tanks without crushing the berries. Alcoholic fermentation starts gradually and last around 10-12 days, followed by several weeks of post-fermentation maceration, with mostly pumpovers and a few punchdowns. The young wines are then barreled down for malolactic fermentation. 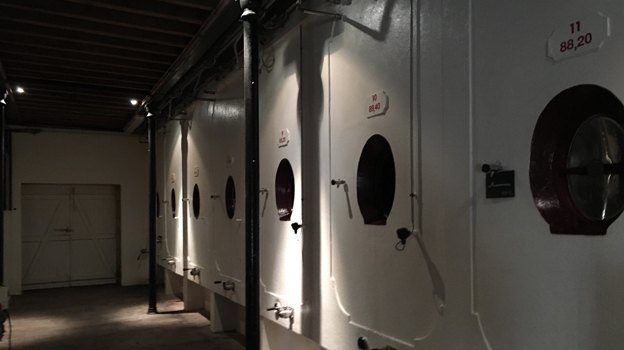 One of the most unique attributes of the tiny cellar at Larcis is the significant presence of 500-liter barrels. 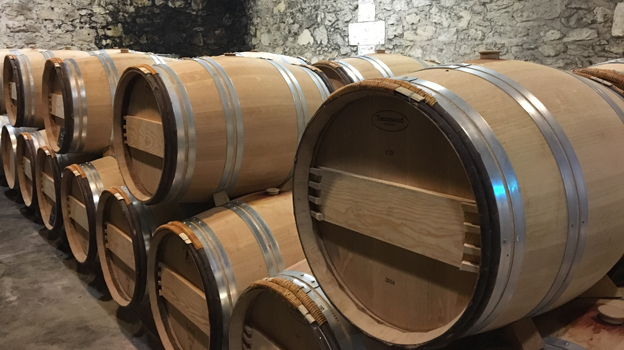 Larger barrels are becoming more widely used in many regions around the world, but they are rarely seen in Bordeaux. The wines spend a total of 16-18 months in oak prior to bottling. In 2010, Larcis introduced a second wine, Murmure de Larcis Ducasse, which seems to have helped push quality even higher. The 2014 Larcis Ducasse is soft, silky and nuanced. Dark cherry, plum, tobacco, mint and spice flesh out effortlessly in a midweight Larcis that will drink well with minimal cellaring. There is gorgeous depth and density in the glass, but the 2014 also appears to be a bit closed following its bottling in May 2016. With time in the glass, the wine's raciness and voluptuousness start to emerge. Even so, I would prefer to cellar the 2014 for at least a few years. One of the dark horses of this difficult vintage, the 2013 Larcis Ducasse is a pretty, mid-weight wine that captures pretty much all that was possible in a year most would like to forget. Dark cherry, spice, leather, tobacco and earthy notes all develop in the glass. There is lovely depth for the vintage, and impeccable overall balance. It should drink well for the next several decades. It is one of the unqualified successes of the vintage and also has the potential to surprise somewhere down the line. The 2012 Larcis Ducasse is gorgeous. Bright, floral and silky on the palate, the 2012 exudes freshness and class. Silky, perfumed and exceptionally polished, the 2012 is absolutely gorgeous. It may not be the biggest, richest or most powerful wine in this tasting, but it is surely among the most delicious. The 2012 can be enjoyed now for its youthful fruit or cellared for several decades. One of the highlights in this tasting, the 2010 Larcis Ducasse is simply stunning. Although quite fresh, vibrant and intense, the 2010 is also very closed in on itself. Violet, lavender, graphite and menthol are some of the many notes that give the 2010 its energy and tension. Still very much closed, the 2010 is going to need a good few years to come into its own. Still, it is pretty impressive today. With time in the glass, the 2010 gives a very good idea of what is to come for those who can wait. The 2009 Larcis Ducasse is an exotic, flamboyant wine endowed with remarkable depth and pure pedigree. Sweet tobacco, mint, pine and red-fleshed fruits are front and center. Even with all of its voluptuousness and richness, the 2009 is firm and quite tannic. Readers should be prepared to cellar it for at least a handful of years. One of my absolute favorite wines in this vertical is the 2008 Larcis Ducasse. Black cherry, plum, smoke, licorice, graphite and incense wrap around the palate in a deep, unctuous Saint-Émilion endowed with remarkable depth and pure sensuality. The tannins have softened enough that the 2008 can be enjoyed relatively soon, but it also has the depth to age. This is a superb showing. The 2005 Larcis Ducasse offers an intriguing interplay of bright, lifted aromatics and intense tannins that still need time to soften. The 2005 Larcis does not offer the sheer appeal that so many other 2005s do today. That is probably a good thing for its future potential, but readers should be prepared to cellar the 2005 for at least a few years. One of the real surprises in this tasting, the 2004 Larcis Ducasse is a gorgeous wine for near and medium term drinking. The first signs of aromatic development have set in, as evidenced by a striking bouquet of truffle, cedar, sandalwood and spice box. On the palate, the 2004 is dark and savory, with notable concentration, but in the mid-weight style of the vintage. The 2004 will probably not be as long lived as other wines in this vertical, but it is among the most satisfying today. The late October harvest yielded an intensely aromatic, nuanced Larcis. The 2000 Larcis Ducasse is an attractive but light-bodied wine, especially given the context of the vintage. The 2000 offers lovely brightness and freshness, but it lacks a bit of body. Even so, it should age gracefully for many years to come. I find the 2000 a pretty wine, but one that lacks visceral thrill that has become customary here in recent years. Sweet tobacco, truffle, white pepper and dried cherry give the 1998 Larcis Ducasse much of its lifted, aromatic personality. Early tertiary notes have begun to develop in the glass that add to the wine's completeness today. A mid-weight, gracious Larcis, the 1998 will drink well for another 10-15 years, perhaps more. Like the 2000, the 1998 presents a decidedly delicate, understated expression of this site. The 1995 Larcis Ducasse is a very beautiful wine. It also shows a good bit of the density that is missing from so many of the wines of this era at Larcis. Sweet tobacco, truffle, white pepper, mint and dried cherry notes all lift from the glass. Sensual, silky and beautifully polished, the 1995 is a terrific choice for drinking now and over the next decade or so. Unfortunately, the wines from 1988, 1989 and 1990 are disappointing. The 1990 Larcis Ducasse has not aged evenly. All of the elements occupy their own space as the wine has begun to fall apart. The aromatics are fully mature, while the tannins have never softened. Even so, there is good depth to the fruit and more freshness on the palate than in the bouquet. The 1990 will likely still hold for a few years, but any future drinking will happen past its peak. The 1989 Larcis Ducasse is burly and rough around the edges, but it has aged evenly, as all of its elements are relatively well balanced. Dried cherry, tobacco, crushed flowers and earthy notes are the signatures of a wine that has reached its full maturity. 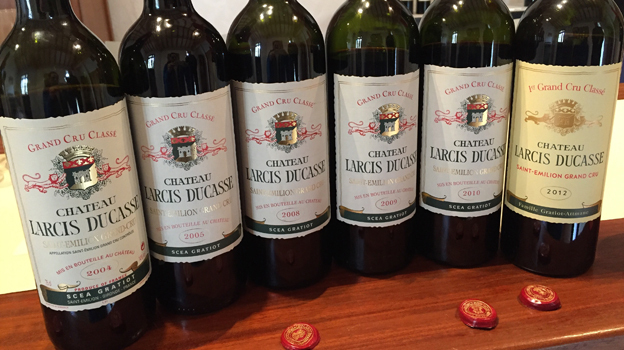 The best of these wines from the trio of 1988, 1989 and 1990 vintages, the 1988 Larcis Ducasse is a rustic wine, but it has also aged relatively well for the standards of the time. Expressive and floral notes give the wine its aromatic lift and perfume. Tasted next to the 1990 and 1989, the 1988 is a bit more delicate and also fresher, with more refinement in its tannins than either of those wines and the mid-weight structure that was typical of the wines of this period. The 1998 will drink well for at least a few more years, but not more. 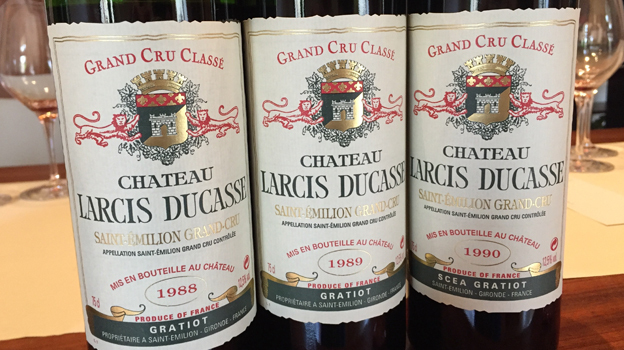 The 1982 Larcis Ducasse is a gorgeous wine that shows why this vintage achieved its iconic status. Still rich, layered and creamy, the 1982 possesses notable concentration and depth. The aromatics are pretty much mature, but there is enough density in the glass for the 1982 to drink well for another few years, even if it is past peak. Tasted from magnum, the 1971 Larcis Ducasse is intense and also quite bold, if a bit rough around the edges, with fully mature aromatics but enough palate density to drink well for another handful of years. Readers should expect a fully mature, rustic Saint-Émilion. All things considered, though the 1971 has held up well. 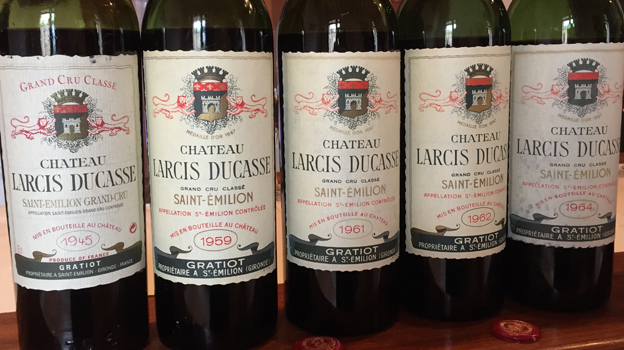 Although the 1970 Larcis Ducasse possesses impressive color density and concentration, it is also oxidized. Given the wine's color and intensity, it is almost certainly the cork that has failed here. The 1967 Larcis Ducasse is a pure joy to taste. Still deep in color and richly concentrated on the palate, the 1967 exudes depth as well as a surprising amount of intensity. In a strict technical sense, there is a bit of volatile acidity, but that is not enough to detract from what is an immensely pleasing, impeccable 40 year-old Saint-Émilion. Perfectly stored bottles will hold for a few years, but the wine is fully mature. Another impeccable wine from the 1960s, the 1966 Larcis Ducasse has held up beautifully. It doesn't quite have the charm of the 1967, but it is also not far behind. Dark cherry, leather, mint, tobacco, mushroom and spice nuances are laced throughout. Any remaining bottles need to be finished, as the 1966 is now fully mature. The 1964 Larcis Ducasse is truly remarkable. Dense, deep and powerful, the 1964 Larcis possesses exceptional depth and sheer concentration for a wine of its age. Intense black cherry, smoke, leather and licorice all flesh out in the glass. The aromatics are perhaps a bit more advanced than the palate, but I can't hold that against a wine that has aged so spectacularly well. A drop-dead gorgeous Saint-Émilion, the 1962 Larcis Ducasse is the most precise, elegant and refined of the 1960s wines in this vertical. The 1962 is remarkably fresh and nuanced, especially for a wine of its age. The mid-weight, lifted structure is almost Pinot-like in its sensuality. This is a striking wine by any measure. The 1961 Larcis Ducasse is a total knockout. Deep, dense and surprisingly concentrated, the 1961 has it all. Succulent dark cherry, plum, spice, tobacco and expressive soil-driven notes flesh out in a wine with shocking textural density and unctuousness. Then again, that's 1961. In a word: magnificent! What a pleasure it is to taste the 1959 Larcis Ducasse. Ripe, rich and seductive, the 1959 captures all of the richness and intensity of the year. The 1959 is a decidedly opulent, flamboyant Larcis with remarkable fruit density. Although fully mature, the 1959 has enough depth to drink well for at least another few years. The 1945 Larcis Ducasse brings this tasting to a rapturous close. A striking, fully mature Saint-Émilion that has stood the test of time, the 1945 is a pure joy to taste for so many reasons, including the historical context of the time when it was made towards the end of World War II. Sweet tobacco, dried cherry, mint, pine and anise give the wine its lifted aromatic profile and yet there is plenty of depth to the fruit, especially for a wine of this age. Naturally, the 1945 is fully mature, but well-stored bottles still have both pleasure and intellectual fascination to give. Nicolas Thienpont adds that as a child he grew up hearing stories of how his cousins at Vieux Château Certan added ice to the musts in an attempt to keep temperatures from getting out of control during fermentation. It was a different time, that is for sure.